Once again the Obamas bring embarrassment to America. First Lady Michelle Obama traveled to Japan to discuss women’s rights, but she tripped and fell right in front of the very formal Japanese royal family. 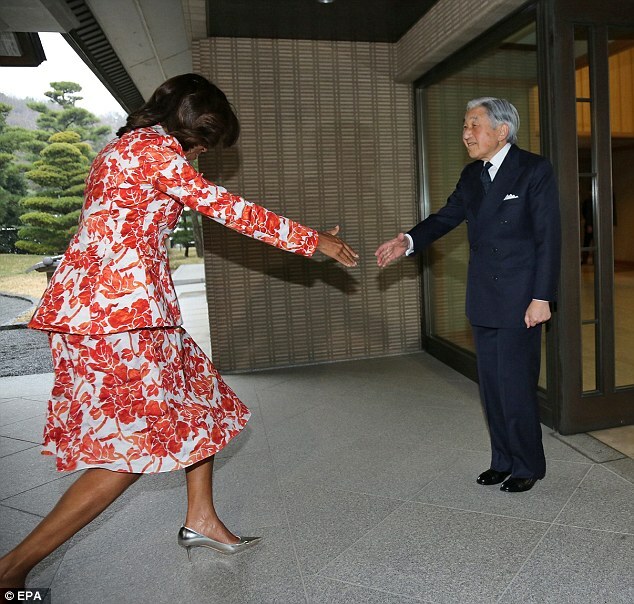 Ooops: First Lady Michelle Obama trips over her silver pumps as she moves in to greet Japanese officials with a very firm handshake. Michelle Obama, who is 5’9″ talls, also grabbed members of the Royal Family, almost as worse offense as touching the Queen of England.